For other usages, see Forsaken Catapult (disambiguation). The Forsaken catapult (or blight spreaders) is a type of Forsaken catapult found in Wintergrasp and Lordaeron. They are much quicker than the demolisher, with faster acceleration and quicker turning speed. However, it does not have as long as a range as the demolisher and does not inflict as much damage. It does not carry any passengers but has a frontal flame attack. This is the lowest cost vehicle available. 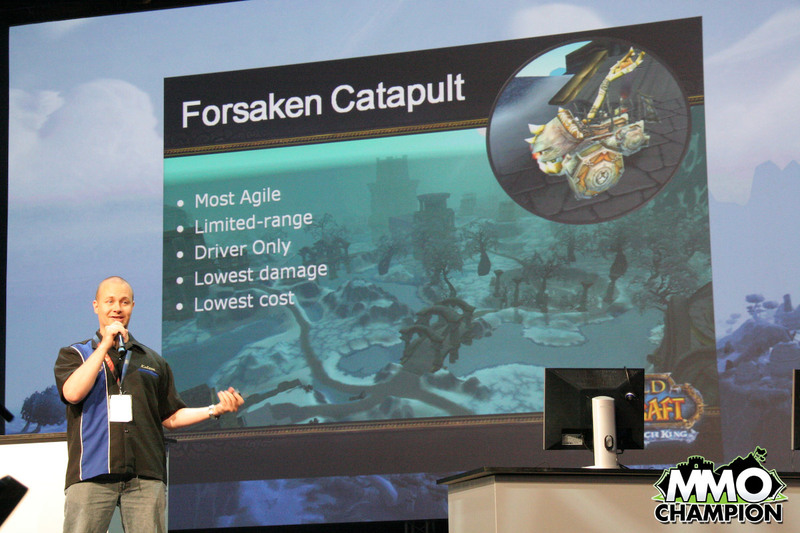 Catapults have been used as both as blight-spreaders and siege weapons by the Forsaken. They typically launch barrels of the New Plague which explode on impact, makes the land toxic, and typically turn its targets into shapeless piles of goo. The catapults have been equipped on Forsaken battleships providing projectile weapons and blight anti-air to their ships. According to Sylvanas Windrunner, the Bilgewater Cartel have modified them to be faster and more powerful. The preview info was mainly about the Wintergrasp Catapult. Forsaken catapults were used by Grand Apothecary Putress at the Battle of Angrathar the Wrathgate to hurl the containers of blight onto the battlefield. Forsaken Catapult model from WWI. This page was last edited on 29 October 2018, at 14:06.